Diabetes is a metabolic disorder. It occurs when pancreas fail to produce sufficient amount of insulin for absorption of glucose from the blood. It is also known as hyperglycaemia. Pancreas secretes insulin for proper metabolism of blood glucose. When pancreas fails to work properly, there is decreased secretion of insulin hormone that may cause diabetes mellitus. It is a disorder and many people control diabetes by making changes in lifestyle and by controlling their diet. There are generally two types of diabetes. Type 1 diabetes and type 2 diabetes. In type 1 diabetes, pancreas fails to produce insulin at all. It mostly occurs in children and people suffering from type 1 diabetes have to take artificial insulin from outside in the form of injections. They have to depend upon insulin injections for whole life. In type 2 diabetes, pancreas produce little amount of insulin. There is decreased secretion of insulin as required by the body and this may cause an imbalance in the body. It mostly occurs after middle age or in grown up individuals. People suffering from type 2 diabetes have to take diabetic medications to stimulate pancreas to secrete required amount of insulin. Along with medications people can also make changes in diet and lifestyle to reduce blood sugar levels. Natural remedies also help in the treatment of diabetes. Diabetes herbal treatment helps in controlling blood sugar naturally and do not produce any side effects. Increased thirst is the most important symptom of diabetes. People complain of increased thirst especially at night. Another important symptom of diabetes is increased urination. Frequency of urination increases at night. Patient has to move to the washroom frequently to empty the bladder. Body feels weak. There is weakness all over the body. Lethargy and tiredness are common symptoms in people suffering from diabetes. Vision may get affected due to increased blood glucose levels. Skin problems are common in people suffering from hyperglycaemia. There is increased itching and burning of the skin. Skin becomes rough and dry. Wounds take a long time to heal properly in diabetic people. Numbness of fingers is also a common symptom and it occurs due to weakness of the nervous system. Tingling and burning of feet is also common in diabetic people. Some people may also suffer from tremors and cool perspiration all over the body. Different types of diabetes may be produced by different reasons. Type 1 diabetes is an autoimmune disorder and it affects the beta cells of the pancreas. Beta cells of pancreas secrete insulin and when beta cells get affected there is decreased production of insulin which may cause high blood glucose levels. Heredity plays an important role in producing diabetes. When both parents suffer from diabetes, then children are more prone to suffer from diabetes at a later age. Intake of over the counter medicines without consulting a physician can also cause diabetes. Self medication can also cause other disorders. Obesity is another important factor that can increase the risk of developing diabetes. There are many natural remedies for diabetes. Herbal and natural remedies help to get rid of diabetes naturally. There are lots of herbal remedies that are available in the market for controlling blood sugar. 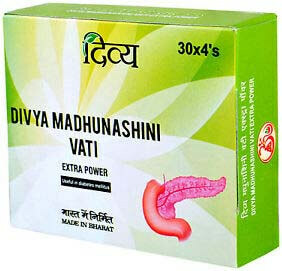 Divya Madhunashini vati is a natural remedy for diabetes. It is an ayurvedic medicine for diabetes. You can take this natural remedy for diabetes without any consultation. It is made up of safe herbal remedies and is a good diabetes herbal treatment. You may take this ayurvedic medicine for diabetes regularly along with other medicines for some time and then reduce your prescription medicine slowly. It stimulates the pancreas to secrete the required amount of insulin for proper absorption of the glucose. Divya madhunashini vati is an excellent ayurvedic medicine for diabetes. It is a suitable remedy for people of all ages. This is a wonderful diabetes herbal treatment that does not produce any side effects even when taken regularly for a longer period of time. It stimulates pancreas for normal functioning. Take one or two tablets half an hour before food two times in a day.